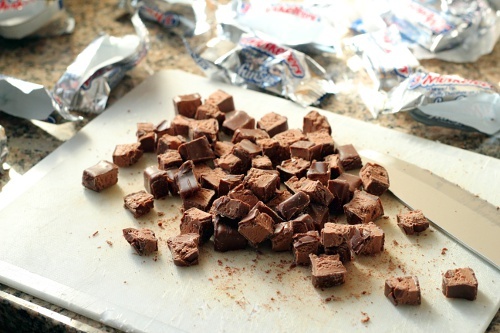 Want something creative to do with that Halloween candy? Mike and I were mulling over going to the store to buy Halloween candy on sale, when I remembered 3 Musketeers Pancakes. Sleepovers with all the girl friends were fairly common in high school. And breakfast the next morning was usually pancakes. Pancakes made by Erica because she was the pancake master (mistress?). Usually these were chocolate chip pancakes, but one time Lucy’s mom was out of chocolate chips. We did have candy bars though. I don’t remember if they were 3 Musketeers or Milky Way. Anyway gooey chocolatey breakfast ensued. Remembering it this morning brought a smile to my face, so this recipe is for the Nerinx ladies. 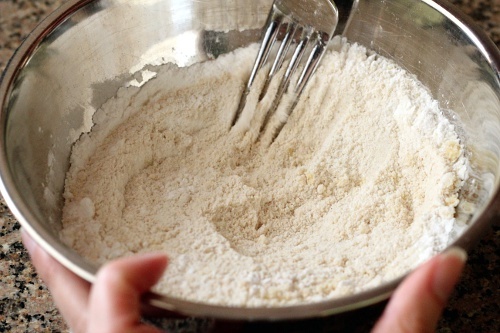 Mix the flours, sugar, baking powder, and salt in a bowl. 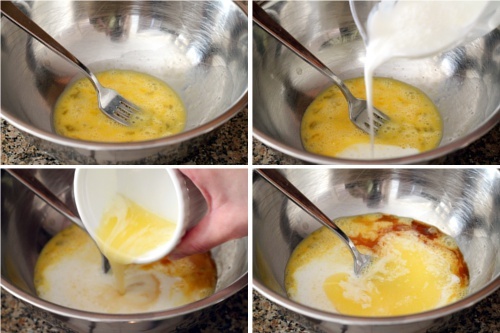 Crack the egg into a large bowl and beat lightly. Stir in the buttermilk, butter, and vanilla extract. Add the flour mixture into the buttermilk mixture and stir until just combined. Heat a griddle or frying pan over medium heat. Once hot, film the surface with butter. Drop spoonfuls of batter onto the griddle. 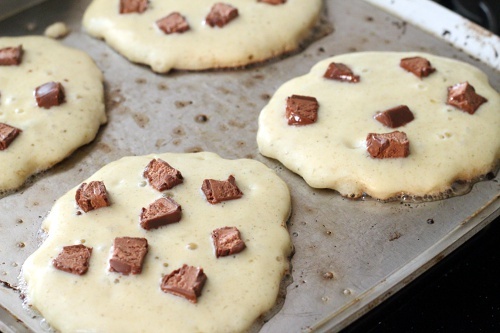 Place chunks of 3 Musketeers in the pancakes. Once pancakes start to bubble, flip and cook a minute or two more, then remove from pan. Film the pan with a bit more butter, and repeat with remaining batter and 3 Musketeers chunks. Serve. The trick with pancakes is to make sure the pan is nice and hot before you add the batter. But you have to be careful that it doesn’t get too hot, or your pancakes will burn. You may need to reduce the heat a bit between batches. Spreading the candy chunks out by hand allows for even candy distribution. You can be lazy and toss the chunks in with the batter too though. However, by hand placing the candy, it gets contact with the pan once the pancake is flipped, so the edges get all crispy and the nougat gets melty and gooey. You probably don’t want to miss that. The standard substitution for buttermilk is to take 1 cup of milk and add 1 tablespoon of white vinegar or lemon juice. (That’d be 1 1/2 teaspoons of acid for the 1/2 cup of milk you need here.) You could do that if you don’t have the buttermilk. Or you could probably get away with using regular milk as well. 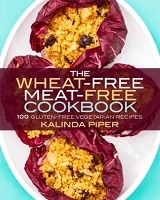 This recipe is also appearing in These Chicks Cooked, What’s Cooking Wednesday and Full Plate Thursday. wow- what a decadent breakfast ;) perfect for a sleepover with the gals! You’re crazy! 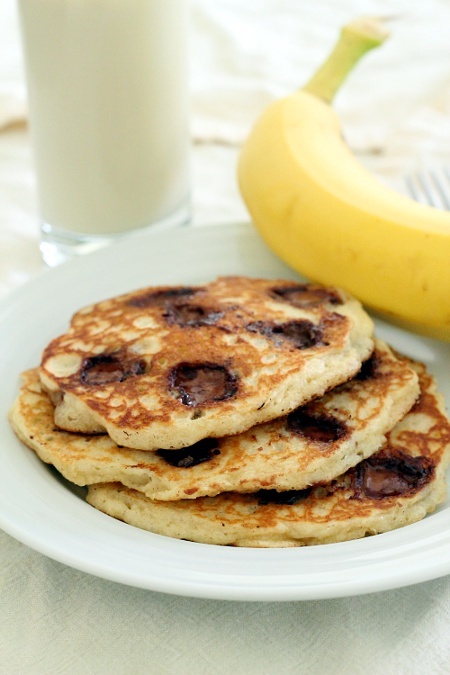 Chocolate bars in pancakes! We’re going to have to try that one out. It sounds too crazy not to try. Ha. I’ll admit it’s kind of ridiculous, but eating a candy bar pancake every now and then never hurt anyone. I would hope that I could get the 3/4 cup of Musketeers in the Pancakes, I would most likely make it there with 1/4 cup, opps, what happened, the dog ate them right? 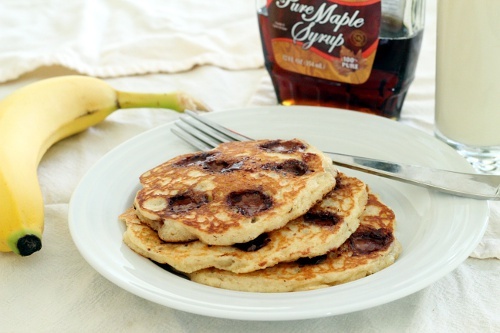 We would just love these pancakes! Thank you so much for sharing with Full Plate Thursday. Hope you are having a great week and come back soon! There is no gluten or wheat in musketeers? Yes, currently 3 Musketeers are listed as gluten-free. As with most large candy companies, they still encourage you to always read the labels, as the labels are the best way to keep track of allergens.